The Meconopsis genus contains short lived hardy perennials that reach a height of 1 to 5 feet (30 cm to 1.5 m). They carry poppy like flowers that can bloom in spring, summer or the start of autumn (species dependent). Many Meconopsis species are known for their blue poppy like flowers but they can also carry flowers of many other colors including white, orange, pink and yellow. Some of the common names for Meconopsis include Welsh Poppy, Asiatic Poppy, Blue Poppy and Harebell Poppy. The Blue Poppy is the national flower of Bhutan. Welsh poppies can be invasive. The seeds of the Meconopsis should be sown on the surface; this can wither be done just before the last frost of spring or towards the end of autumn. 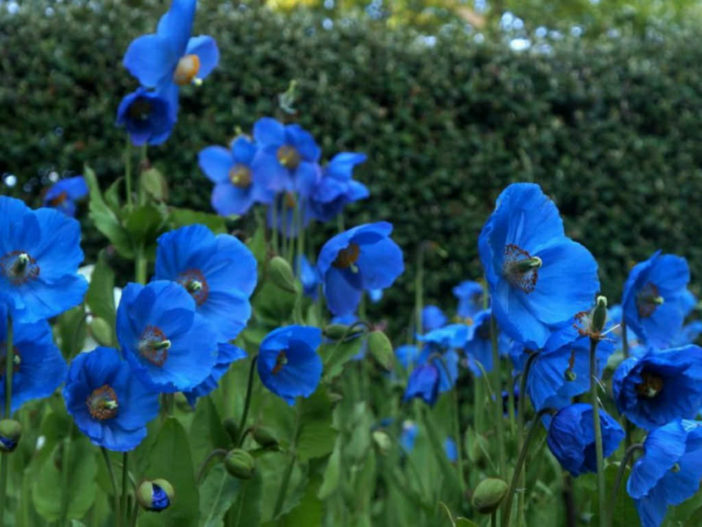 Blue Poppies prefer to grow in a shady or partially shady part of the gardens but can tolerate sunny areas in milder climates. They like a rich acidic soil, ideally the soil should be kept moist in the summer, but allowed to dry in the winter. When starting Blue Poppy off indoors do so about two months in advance. The Meconopsis seeds should be sown in vermiculite. It should take about two to four weeks for blue poppy to germinate at 54 to 64 degrees Fahrenheit (12 to 18 degrees Celsius). Once growing the seedlings should be watered from beneath. Once ready transplant the young Meconopsis plants at a spacing of 12 inches/30 cm (small) to 2.5-3 feet/75-90 cm (large) apart. This should be done following the last frost of spring.